Marquette's Derrick Wilson, bottom, and New Mexico's Kendall Williams, top, battle for a loose ball during the first half of an NCAA college basketball game on Saturday in Las Vegas. LAS VEGAS (AP) — Freshman Cullen Neal scored a career-high 24 points, including six 3-pointers, to lead New Mexico past Marquette 75-68 at the MGM Grand Showcase benefiting Coaches vs. Cancer on Saturday night. Neal attempted eight 3-point shots and was 8 of 12 from the field. His six 3-pointers also were a career high. Cameron Bairstow added 20 points, 10 rebounds and 5 assists for New Mexico (8-3). Bairstow hit all eight of his free-throw attempts. Kendall Williams added 14 points, while Deshawn Delaney had 10 points and 10 rebounds. Jake Thomas led Marquette (7-5) with 17 points, converting four 3-pointers. Jamil Wilson added 15 points, while Todd Mayo had 10. New Mexico outscored Marquette in the second half, 45-31. After trailing 37-30 at halftime and later by nine, the Lobos hit 8 of their first 12 second-half shots to rally for a 53-47 advantage with 11:53 to go. The Golden Eagles scored the next nine points to lead by three with 9:08 remaining. 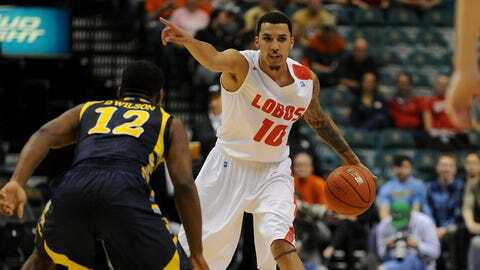 The Lobos responded with an 11-4 run, taking the lead for good at 61-60 on a Bairstow free throw with 5:23 left. New Mexico later built 70-62 lead, its largest, with 1:08 left. The Lobos shot 50 percent from the field in the second half, while the Golden Eagles were at 36. New Mexico’s last trip to Las Vegas in March resulted in the Mountain West Conference title, winning three games at the Thomas & Mack Center. The Golden Eagles led at intermission thanks to 58 percent shooting from the field. After five lead changes, Marquette took the lead for the rest of the half at 25-24 with 5:08 left in the half. Both teams built seven-point first-half leads. This was the first-ever meeting between the two teams.